If you’re feeling forgetful, it could be due to a lack of sleep or a number of other reasons including genetics, level of physical activity, and lifestyle and environmental factors. 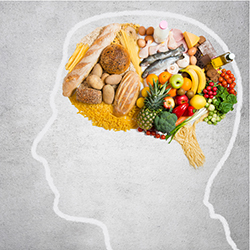 However, there’s no doubt that diet plays a major role in brain health. The best menu for boosting memory and brain function is the the Mediterranean Diet. The diet encourages good blood flow to the brain and nourishes and protects the heart. A recent study found that the Mediterranean Diet helps keep aging brains sharp, and a growing body of evidence links foods, such as those in the Mediterranean Diet, with better cognitive function, memory, and alertness. Eat your veggies. You’re not likely to forget this message. Getting adequate vegetables, especially cruciferous ones like broccoli, cabbage, and dark leafy greens, may help improve memory. Try a raw kale salad or substitute collard greens for the tortilla in your next sandwich wrap. Also, broccoli stir-fry is an excellent option for lunch or dinner. Be sweet on berries and cherries. Berries, especially dark ones like blackberries, blueberries, and cherries are a rich source of anthocyanins and other flavonoids that may boost memory function. Enjoy a handful of berries for a snack, mixed into cereal or baked into an antioxidant-rich dessert. You can reap these benefits from fresh, frozen or dried berries and cherries. Get adequate omega-3 fatty acids. Essential for good brain health, omega-3 fatty acids, docosahexaenoic acid (DHA) in particular, may help improve memory in healthy young adults. “DHA is the most abundant fatty acid in the brain. It makes sense that if you have higher levels of DHA in the blood, then the brain will operate more efficiently,” says Andrea Giancoli, RD, registered dietitian and Academy of Nutrition and Dietetics spokesperson. Seafood, algae, and fatty fish, such as salmon, bluefin tuna, sardines, and herring, are some of the best sources of omega-3 fatty acids. Substitute fish for meat a couple of times each week to get a healthy dose. Grill, bake or broil fish for ultimate flavor and health. Try salmon tacos with red cabbage slaw, snack on sardines or enjoy seared tuna on salad greens for dinner. If you don’t eat fish, discuss supplementation with your doctor or Registered Dietitian. You can get omega-3 fatty acids from fish oil, seaweed or microalgae supplements. These foods are not just good for the brain but also for the heart and all parts of the body. While there’s no guarantee that these foods will help you remember where you put your keys tomorrow, over time they can support lifelong good health. Dairy products are amazing sources of calcium, vitamin D, potassium, protein, and other important nutrients. Make sure to get your dairy every day to maintain bone health at all ages.